. We have been spending a lot of time in the yard playing with the kids. I play soccer, basketball, and football with the boys on a daily basis and we’ve stepped it up during the Easter holiday break. It is so nice to have loads of time at home with my family. The weather has not been great, but we don’t care. It has been a relaxing and rejuvanating holiday. 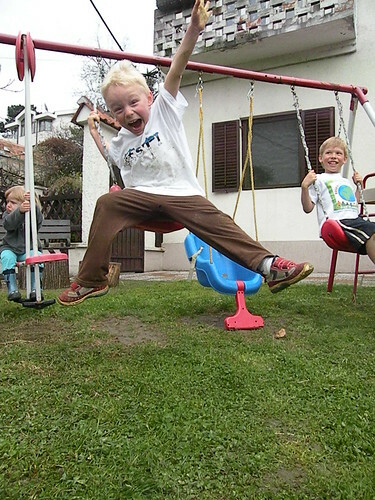 As you can see in the photos, the boys like to jump off the swings. Yesterday I cut the lawn for the first time this spring. It really needed it. I am almost finished with planting in the garden. This year besides herbs and flowers, we’ll be trying to grow veggies and fruits. I don’t know why the fascination with gardening hits people as they get older. I can’t get enough of it.